Apples of Gold Jewelry has lovingly crafted another piece of jewelry that will help be a subtle reminder of how important your faith is to you with this Christian cross dog tag pendant. The pendant is a 14K yellow gold dog tag style pendant, with a cut out Christian cross in the middle of the dog tag, as well as a raised golden edge. The pendant measures 10mm in width by 25mm in length, and makes a beautiful gift for anyone. 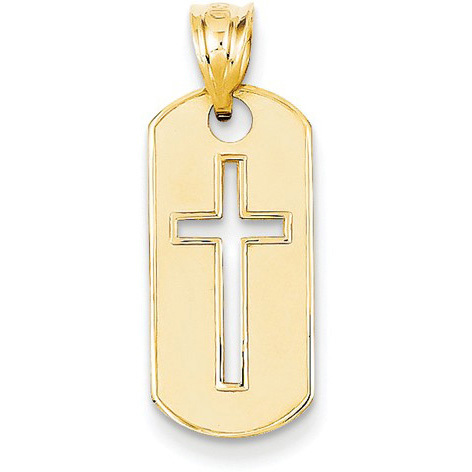 We guarantee our Christian Cross Dog Tag Pendant, 14K Yellow Gold to be high quality, authentic jewelry, as described above.